The classic Rico orange box Tenor Sax reeds are well respected and recommended by many teachers and players alike. They are designed and produced with a thinner tip to make articulation and response as easy as possible. Obviously this suits a beginner and it can help encourage players early with a nice clear and vibrant tone. It's also worth considering that the classic Orange box are still the favourite choice of many Jazz players as the unfiled cut suits many classic Jazz mouthpieces like Otto Link, in fact many of the greatest jazz recordings were made using Rico orange box reeds. 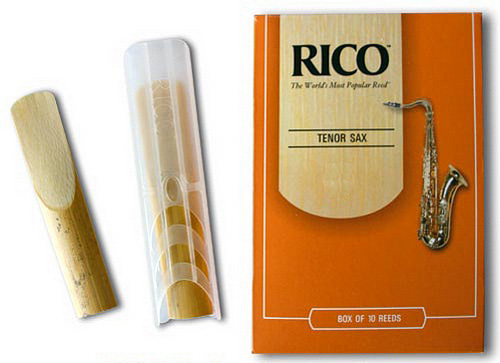 Please note Rico are around 1/2 strength softer than Vandoren. So for example a Rico 2 is equivalent to a Vandoren 1.5 strength. The huge investment over the last 10-15 years by D'Addario into the Rico brand has ensured they are the most consistenly cut and selected reeds on the market. The first three reeds did not come up to my expectations, the fourth reed had that ringing sound but all is not lost I can file the first three and get them to how I want them. Ten in a box. I have ordered different items, (for woodwind and brass), and no matter what the item is, it is always in excellent condition.